I graduated from the church Sunday School system at the age of thirteen, firmly convinced that Christianity was a knowledge-based religion. I didn’t like it, so I dumped it. At the age of thirty I met Jesus; I entered into a relationship with him and I am still in that relationship. Not only that, but I am now in relationship with his church; I have brothers, sisters, and friends. As much as I am against religion I am for relationship. In fact, my conviction is that life, both temporal and eternal is all about relationship. To embrace religion is to let go of Jesus, because Jesus shunned religion. Equally, to believe that Christianity is a private affair is to miss the whole point of it. 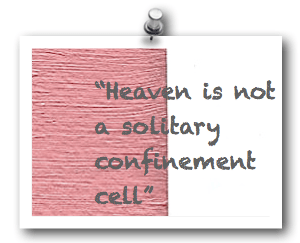 Heaven is not a solitary confinement cell; it is a space of endless ‘family’. To know Jesus is to enter into his family, and to be part of his family is to be part of the church, both here and in heaven. Religions have communities of fellow adherents, but they are lifeless groups gathered around doctrine, or tradition, or a leader. Relationship is the glue of living Christian community. Relationship is also the purpose of that community; I am in the church community not to serve a cause, or to promote a philosophy, or to make converts, but to be in relationship with Jesus and his disciples. Religions are mainly knowledge or skills based. Ones standing and role within a religious system is dependent on what one knows or what can do. Our standing within Christianity is dependent only on who we know, not on what we know. It is also based on what God can do, not on what we can do. In the very first years of the church, the disciples were different from others not because of their knowledge or skills, but because they had been with Jesus. It is still the same today. Hi Chris – Having just read your thoughts on relationship, I felt that this is a wonderful basis for a great message for our people on ecclesia.